More than 1,400 students joined together to raise more than $154,000 for the fight against cancer at St. John’s 13th annual Relay For Life —a new record for the university, which has supported the event since 2006. The event benefited the American Cancer Society and ran from 6 p.m. Friday, April 13 until 6 a.m. on Saturday, April 14. 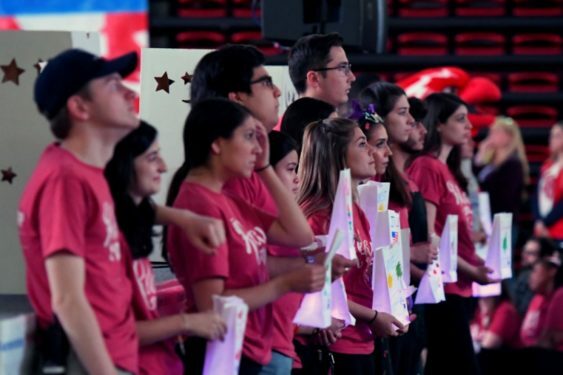 Participants representing 84 teams, student clubs and Greek organizations marched around the perimeter of the basketball court inside Carnesecca Arena on the university’s Queens campus, in support of those who have been affected by cancer. 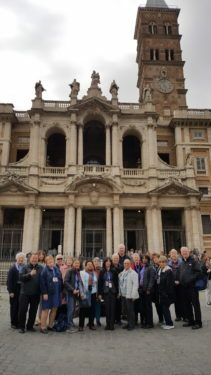 Our Lady of the Snows, N. Floral Park celebrated its 70th anniversary with a parish pilgrimage to Italy where Mass was offered in the Borghese Chapel at the Basilica of St. Mary Major. The chapel recalls the miracle of snow falling on the site on a warm summer night in 352 A.D. Father Kevin McBrien, pastor, and Father Thomas Pettei, episcopal vicar of Queens, led the pilgrimage which included visits to Assisi, Siena and Florence. Enjoy a free, fully staged performance of Verdi’s “Aida,” presented by the Regina Opera Company at Our Lady of Perpetual Help School Auditorium, Sunset Park, May 8, 7:30 p.m. This opera, which tells the tragic story of the secret love affair between an enslaved Ethiopian princess and an Egyptian war hero, will be sung in Italian with English supertitles, and presented with piano accompaniment. More information may be sought via www.reginaopera.org; info@reginaopera.org; or 718-259-2772. On Saturday, May 12, St. Francis Prep’s Art Department will present its annual Spring Arts Festival. The Fresh Meadows school holds the distinction of being recognized by the Middle States Association of Colleges and Schools by earning their Program of Distinction in Visual Art. The theme of this year’s show is “SFP ComiCon,” which will highlight comics and Pop Art. The show will begin at 11 a.m., and there will be premieres of student films in the auditorium. Then at noon, the student gallery will open in the school’s cutting-edge art education facility. At 1 p.m., the performing arts program will take the stage in the school’s auditorium. Other highlights include tables of student art, photo booths, face painting, music provided by students and alumni, and student designed fashion. Student artwork will be raffled, and there will be a demonstration table with acrylics. The evening will conclude with the induction of approximately 90 students into Prep’s chapter of the National Art Honor Society. Tickets are $5 for the whole day, and are available at the door or in advance in the Art department office at Prep. For more information, visit www.sfponline.org; email rjohnston@stfrancisprep.org; or call 718-423-8810, ext. 255 or 213.